Recently, I dug into the Master Your Money Super Bundle and found some reasons you might not want to purchase it. And I found some reasons this might be perfect for you. There’s a massive sale going on right now, and I need to be very honest about it. If you follow our Live morning classes, Instagram Stories, or receive the 1-Min Email, you know I’ve been excited about the Master Your Money Super Bundle – it’s basically $1200+ worth of books, courses, videos, planners, printables, and memberships all reduced to a $37 package deal. Pretty great, right? Except it’s not always. I say this because I want you to win. 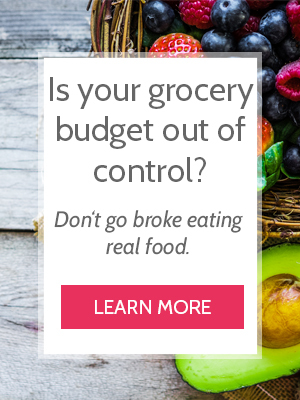 I want to help you save money and eat healthy, and I never want to recommend a product that I don’t think will help you do that. Keep reading to find out exactly what I like and don’t like about this Bundle. Some of the products are overpriced – whether it was underwhelming content or poor video quality, I felt that some of the tools were asking a little much at their full price. You don’t need 45 products to find financial freedom – Good debt management is 80% behavior and 20% head knowledge. So none of these are products are going to replace hard work and the good choices you make every day. While I think some of the products are asking too much for their full price, you’re getting these at a 97% discount – and a lot of the products are worth that and more. Although you can find similar teachings for free online, you would have to find them (and wade through everything that’s not helpful). There is a lot of really good content here literally at your fingertips. Do I think you need 45 products to find financial freedom? No. You don’t. What you really need is a little knowledge, a united plan (if you are part of a family unit), and discipline. However, personal finance is a very personal journey. There are a lot of tools here to help you on that journey, give you that knowledge, and make the process easier. The 30-Day Happiness Guarantee – if for any reason you decide this bundle was a bad decision, Ultimate Bundles will refund you the money, no questions asked! They are committed to helping you win, which is why I like this company so much. After spending a significant amount of time digging through the bundle, here are my favorite products. I think these bring enough power that they make the bundle well worth it’s cost and can help you make up any cost of the bundle (and far more!). I didn’t want to list them all, because that would be overwhelming. But you can read the full product list here. So there are my reasons why you might want to pass on this bundle and why the Master Your Money Super Bundle might be perfect for you. Because I want you to win, if you decide to purchase this bundle I want to help you use the tools to the best of your ability. After you purchase, simply forward your purchase confirmation email to me (contact@cheapskatecook.com), and that qualifies you to a one-hour video coaching session with me. We’ll talk about money, real food, how to balance it all, and how you can start applying the Bundle to your life immediately. If you have already purchased a Bundle, you get a free coaching session too! Just follow the same instructions. I love these coaching sessions so much, and I can’t wait to chat with you soon. If you want to try it (remember the 30-Day guarantee! ), you only have a little bit of time left! The sale ends at midnight on Sunday, March 31, 2019.